In 2007, Thomas S. Robertson was appointed Dean and Reliance Professor of Management and Private Enterprise at the Wharton School. He brings a distinctive international and interdisciplinary vision of business education in the 21st century to Wharton and a strong record of success in business school management. Robertson is returning to Wharton after a number of years. From 1971 to 1994, he was a faculty member at the School, serving as Pomerantz Professor of Marketing and Chair of the Marketing Department. While Associate Dean for Executive Education, he led the effort to build a major conference center on campus, designed an innovative set of new senior-management programs, and substantially increased financial contributions. 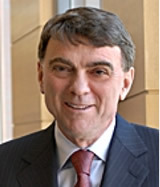 Most recently, Robertson was Chair of International Strategy at Emory University and founding director of Emory’s Institute for Developing Nations, a joint research initiative with The Carter Center. He was Dean of the Goizueta Business School at Emory from 1998 to 2004, and is widely credited with positioning Goizueta as a leading international business school. From 1994 to 1998, Robertson was Sainsbury Professor and Deputy Dean at the London Business School. Previous appointments include the Anderson School at UCLA and Harvard Business School. An expert in marketing strategy and competitive behavior, the diffusion of innovation and consumer behavior, Robertson is author, co-author and editor of a dozen books and almost 100 scholarly articles and book chapters.